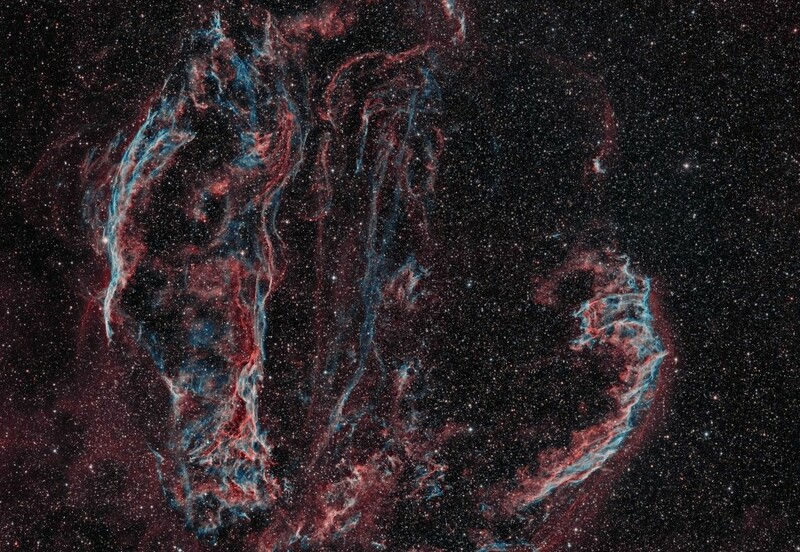 The Veil nebula is a large supernova remnant in the constellation Cygnus. It consists of several nebula each with their own names-> NGC 6960 is the Western Veil, NGC 6992 is the Eastern Veil, Pickering’s Triangle, NGC 6974, and NGC 6979. The entire area is about 3 degrees across at a distance of 1,470 light years. 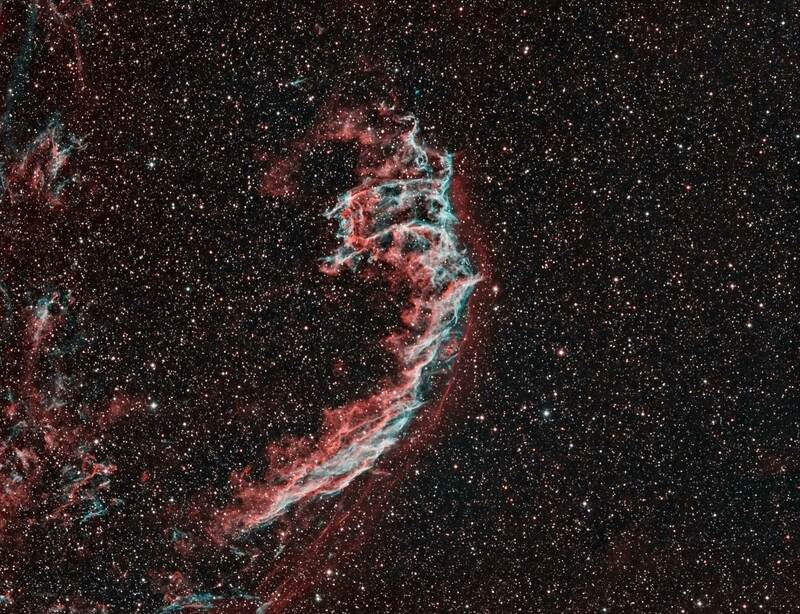 The Veil nebula is the result of a very large star going supernova about 5,000 to 8,000 years ago. The resulting structure is shaped by the very large amounts of energy that form a shock wave that expands into the surrounding space and not only shapes but also illuminates the dust and gas in the area. 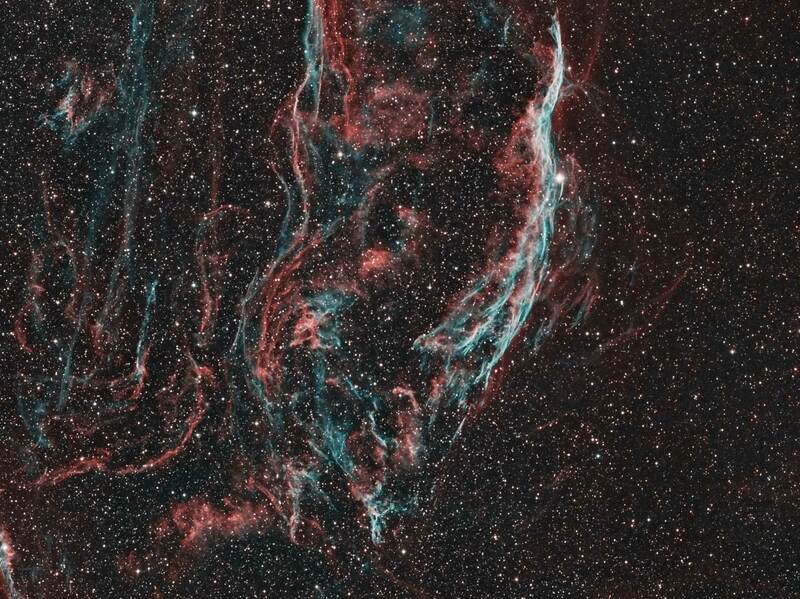 NGC 6960, the Western Veil, has several common names. 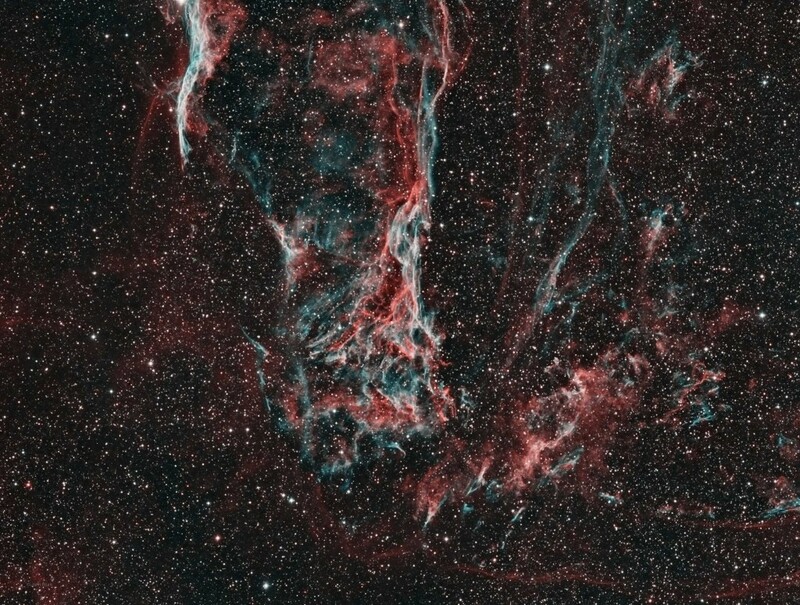 These are the Witches Broom, Finger of God, and Filamentary nebula. The star next to the nebula is 52 Cygni. NGC 6992, the Eastern Veil, also contains NGC 6995 and IC 1340. The thinner part is NGC 6992 and the first wider part is NGC6995 followed by IC 1340. Pickering’s Triangle, is the large broom head shaped object between the Eastern and Western Veil. (Some internet sources name this as NGC 6979 but it is doubtful William Herschel meant this object when he discovered this area. Pickering’s Triangle was discovered by photographs at a later date.) NGC 6974 and NGC 6979 are the two smaller nebula with the brighter knots between Pickering’s and the Eastern Veil. All of the images shown here are captured using only Hydrogen alpha and OIII filters. There is plenty of Sulfur present in this area but I did not like the image color when this filter was added. The mosaic consists of 4 panels consisting of the Eastern, Western, and Pickering’s nebulas plus a filler image to fill in the gap.